I love beetroot but I’m not normally a fan of it on pizza. 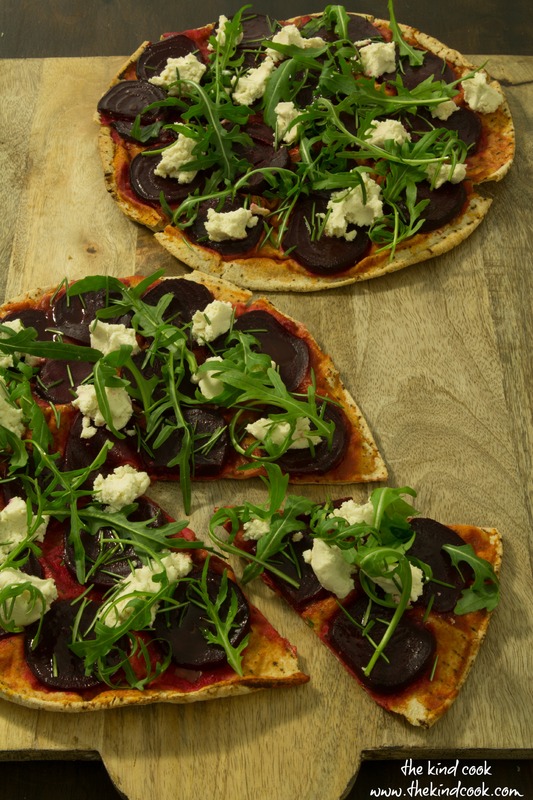 But then Nourish Magazine asked me to do a series of beetroot recipes for one of their publications and among the many recipes I experimented with, I played with a popular beetroot pizza recipe to make it dairy free, vegan and healthier. And whilst doing the recipe development I made so much of this pizza that I came to love it! Make the almond feta the day before. Simply blend all the almond ingredients together in a high powered food blender or food processor, for a few minutes until they are smooth. This takes about 5 minutes. Line a colander with a clean chux and scrape the almond mixture onto the middle of the chux. Bring the sides of the chux up around the mixture and tie it firmly with an elastic band. Place the colander onto a bowl and place it into the fridge to drain over night. Once your feta has drained and you are ready to make your pizzas, preheat your oven to 180c. Lay your Lebanese breads onto oven trays. Top the bread with the passata. Evenly lay the beetroot slices on the passata and place the pizzas in the oven until the bread becomes crisp. Sprinkle the feta, rosemary and rocket on top. Squeeze a little fresh lemon juice onto the pizzas also, just before you serve them. Yields: 8 generous slices of pizza. Time: Once the feta is ready this is such a quick recipe with 10 minutes of preparation and only 10-15 minutes of cooking time. Notes: I use cooked baby beetroots that have been packaged in just their own juices. You find them in supermarkets near the uncooked beetroot. They make this a much quicker recipe and are not packaged in salt and sugar like canned beetroot. 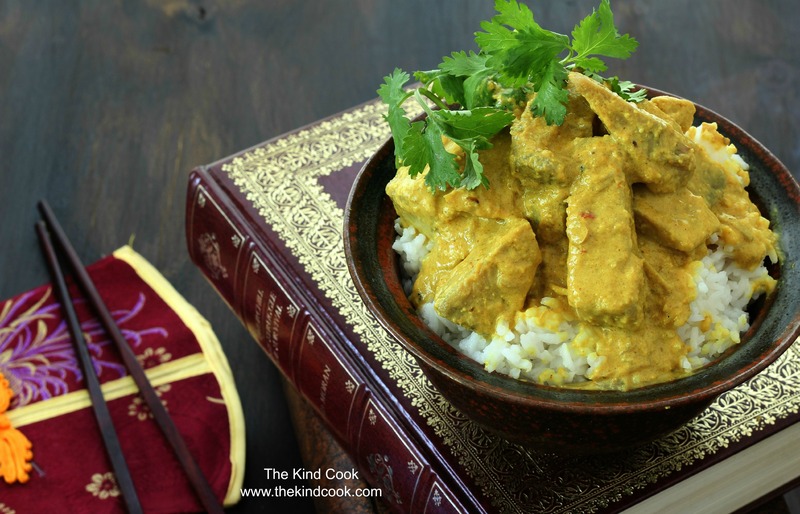 Don’t be afraid of making curries. Once you have the ingredients they are some of the freshest, easiest and fastest recipes to make. Blend the paste ingredients in a mortar and pestle or food processor, until they are well combined and become a paste. Put a small amount of oil into medium pot. Scrape the paste into the pot. Cook it for a few minutes, on a low heat till fragrant. Drain the jackfruit and discard the brine. Cut each of the jackfruit pieces lengthwise into 3 – 4 wedges. Add the jackfruit and the remaining ingredients to the pot with the paste. Bring it to the boil. Reduce it to a low simmer, Place a lid on the pot and cook *gently*for 45 minutes. Discard the cinnamon and lemongrass once the rendang is cooked and serve. Serve with steamed rice and Asian greens. Garnish with loads of fresh coriander. Time: 15 minutes of preparation. 45 – 50 minutes cooking time. You can also purchase jackfruit from Asian or specialty grocers. It is sold in cans. Ensure that it is unripe jackfruit and in brine (NOT syrup). Potatoes, tofu, beans and other vegetables work well as a substitute for jackfruit in this recipe though too. Jars of lime leaf pieces can be found in most supermarkets. Make sure you shake the cans of coconut milk before you measure out your 2 ½ cups! Sriracha hot chilli sauce is found in most Asian grocers and some supermarkets. 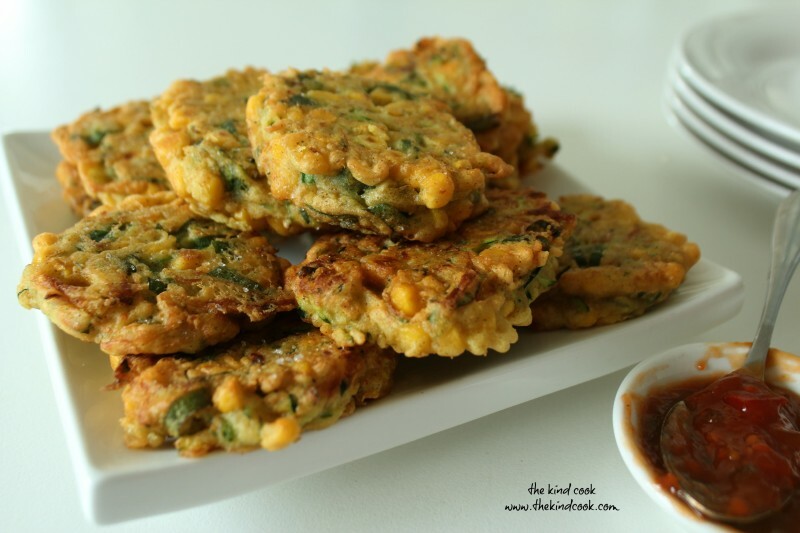 I was playing with corn fritters a few months back but wasn’t quite happy with the result. Then today I was standing in the kitchen once again looking at the 2 gigantic zucchinis I just got from my father in law and a load of corn in the fridge that needed using up. I then wandered through the vegie patch for some inspiration and realised I have not 1, but 2 mint patches and so decided to have another crack at these fritters. It only took 1 practice batch and then another batch with a little less of this and a little more of that and I have ended up with a cracker fritter. Strain all the excess of water out of the grated zucchini using a nut bag, chux or tea towel. Discard the water that comes out of the zucchini and set the zucchini aside. Sift the besan flour into a large bowl and whisk the 3/4 cup of water into, it until you have a smooth batter. Add the remaining ingredients, including your zucchini into the batter and stir well to combine. Heat a pan with a little bit of oil and cook in batches. Drop a generous tablespoon of the batter into the pan. Cook until browned and turn to brown the other side. I find the trick is to have the heat slightly higher at the start so you get a nice colour and the fritters don’t soak up a load of oil and then once both sides are nicely browned, turn the heat down a little and cook a bit further, so that the insides are cooked through. Drain on a clean tea towel. Lightly sprinkle a little salt over each fritter, while they are still piping hot. Serve warm with salad and chutney. Note: Don’t use canned corn. You get a much more plump and sweet corn kernel, if you cook a couple of cobs and cut off the kernels. Be careful when cooking your fritters as the corn can pop! # I tested a couple out in the oven for a fat free version on 175c for about 15-20 minute and they worked out fine. The texture was obviously a little different but they still had a nice crunch. Monday nights are hectic in our household. Everyone has been at work and childcare all day. We are often home late and we want something easy and fast. So I started making my “Cheesy Lemon and Pea Baked Risotto. While the onions were cooking tonight though, I was rummaging around in the fridge and notice a large red capsicum, some coriander and some tandoori paste. This was the result and it’s become one of our favourites. Place the onion and water in an oven tray. Place the tray onto your stove top and cook gently on a medium heat, until the onion starts to soften. Then turn off the heat. Add the rice, nutritional yeast and stock and bring to the boil. Cover tightly (and carefully) with foil and place the tray in the oven for 15 minutes. After the rice has been cooking for 15 minutes, remove the tray from the oven. 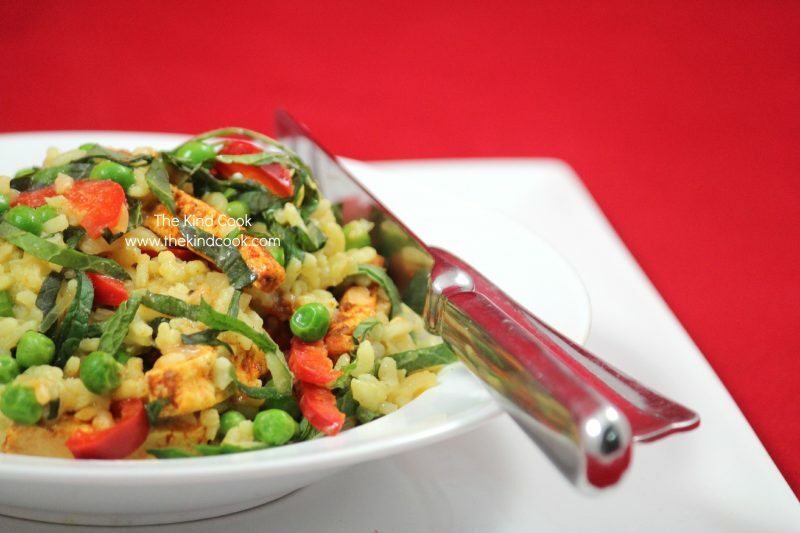 Carefully remove the foil and stir through the capsicum, pea, tofu and coriander. Cover the pan with foil again and place it back into the oven for another 10-15 minutes or until the rice is cooked. Once the rice is cooked, I like to garnish it with a little extra coriander or mint and a dollop of coconut yoghurt. I also serve it with loads of fresh salad. Notes: I have tried a few brands of tofu to date and the one I find I keep going back to is the Blue Lotus brand as it has a much less earthy flavour than other brands. The Nutritional yeast adds a cheesy flavour to the risotto. It is also a source of B12.